I really didn’t want to be there but Crap Frank rides again. On Wednesday we buried my father. He passed away May 11, 2014, Mother’s Day, and we buried him September 10, the day before 9-11, in Arlington National Cemetery. I hope I can do justice to describing the day. The pomp, the circumstance, the sorrow and the laughter of the day are burned into my mind. I just hope I do justice to the telling of the story of the day. Let me start by explaining that I really didn’t expect it to hit me so hard. I really didn’t expect to be impacted the way I was. I handled my dad’s wake and funeral. I was mentally ready for them. I plowed through those days. I made it. Wednesday was something different. It was something I never expected. I didn’t expect it to be so hard. I didn’t expect to be hit like a Mack truck as soon as we pulled up to the cemetary gates. You know those strange licking and swallowing sounds dogs make when they get ready to throw up? Those are the noises I was desperately trying to hide from everyone in our car as Arlington came into view. My mouth started watering profusely and I had to swallow down every ounce of whatever was produced. I thought I was going to throw up right then and there. Somehow, though, I held it together and made sure to keep myself composed as I told the security guard we were there for my dad’s funeral. No one in our car knew, at that point, I was so close to losing the contents of my stomach at the feet of the security guard. As we pulled into the parking lot, I felt my composure return and felt I could handle the rest of the day. We unloaded from our car, a sea of black, pearls, suits, ties and uniforms streaming into the administration building. Friends and family had already started to gather and I took comfort in my old friends who came to honor my dad. There was a peacefulness as family members and old family friends surrounded us. I was comfortable in the room. I was fine there. I knew I didn’t want to go any farther, or have our little time in the quiet room come to an end. But the end of our time came too fast, we given directions and asked to return to our cars. Still no one knew how much I didn’t want to be there. At all. We made our way out to our cars and followed the instructions of Arlington’s funeral director. He told us we were free to follow the caisson carrying my father’s casket on foot as long as we had a driver for every car to follow us to the grave site. We asked a family friend to drive our car so we could all walk together but as I was walking to our car, I saw my college roommate in her car alone. I needed the quiet of her car. I needed to be transported to a different time, a different place and her car was the solace I needed. I made a last second adjustment and jumped in with her. It was then I spilled it. I told her how much I didn’t want to be there. I didn’t want to do this day. I wanted it to just be done, to have it over with. I was ready to have this time closed. She understood. She lost her dad and she knew what I was feeling. It was the comfort I needed. It was then we rounded the corner and I saw a field full of soldiers in uniforms. Stan came to get me, from my friend’s car. He took my hand, and it was then I told him. I told him I didn’t think I was going to make it. I told him I thought I was going to throw up. I told him I didn’t want to be there. I told him I couldn’t do it. The words came tumbling out in a rush. I needed to get them out before I couldn’t get them out anymore. Stan held tight to my hand and told me everythign was going to be ok. I started to pull back. He kept me moving forward. He became my courage. Stan and I stood hand-in-hand as I took in the military might before me. 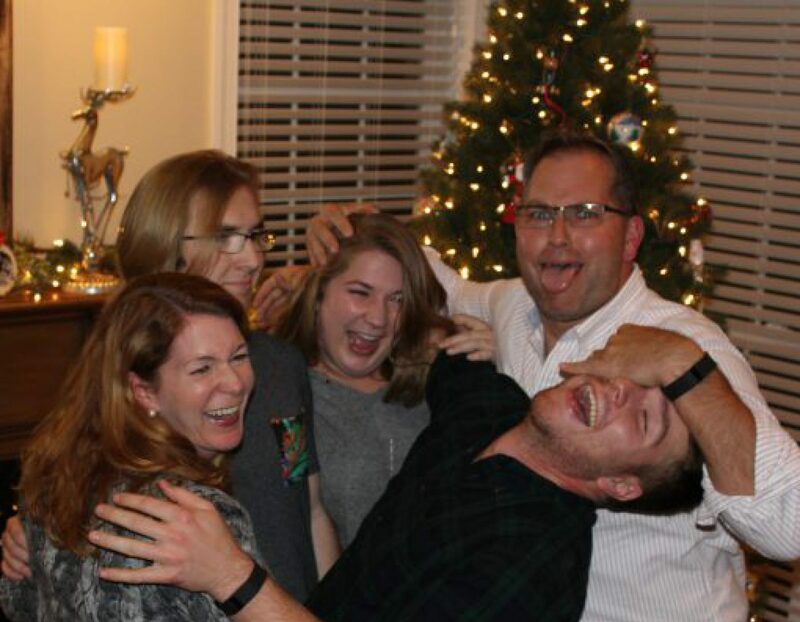 They were all there for my dad, and for us. 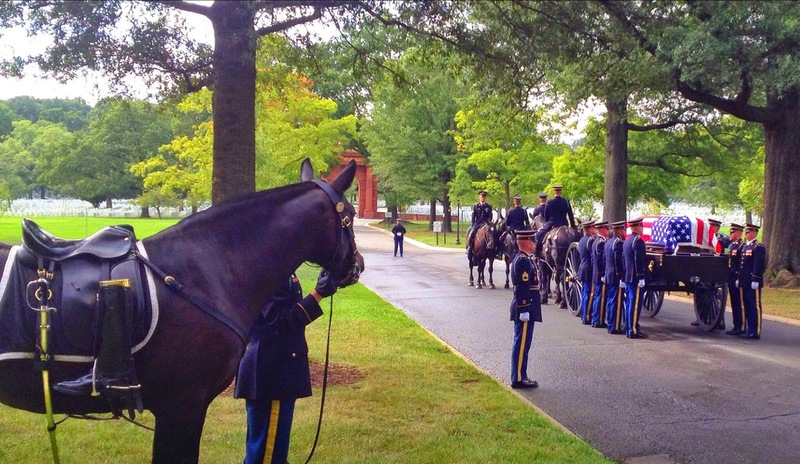 The black, gleaming horse drawn caisson stood quiet and ready to accept my dad’s casket. Two horses stood silently with their soldiers mounted on their backs. Their boots and saddles shone brightly in the sunlight as they remained patient and ready at the side of the caisson. 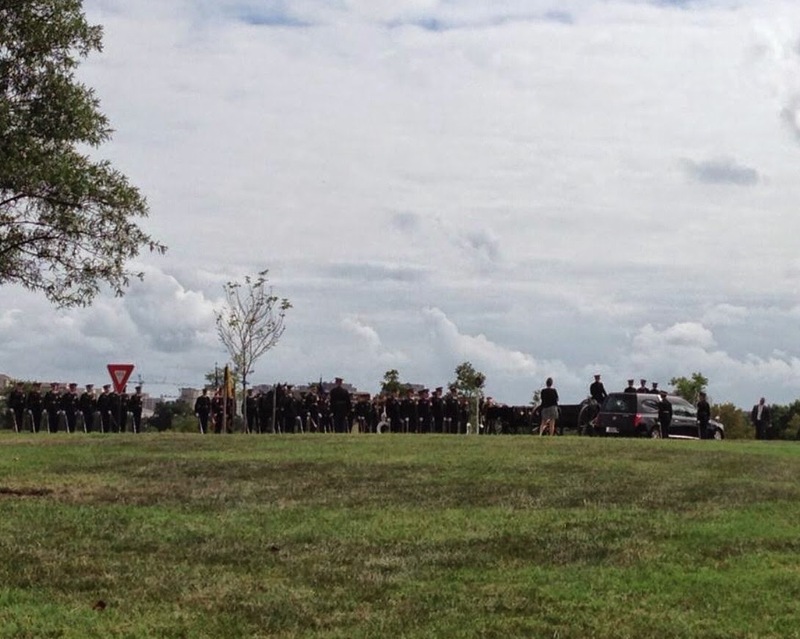 The pallbearers stood tall and proud in between the caisson and the hearse. The color guard was flanked by two infantry platoons. The Army band, with their gleaming, perfectly polished intruments stood to the side and began their drum beat as the color guard was called to post their flags and the platoons were called to attention. 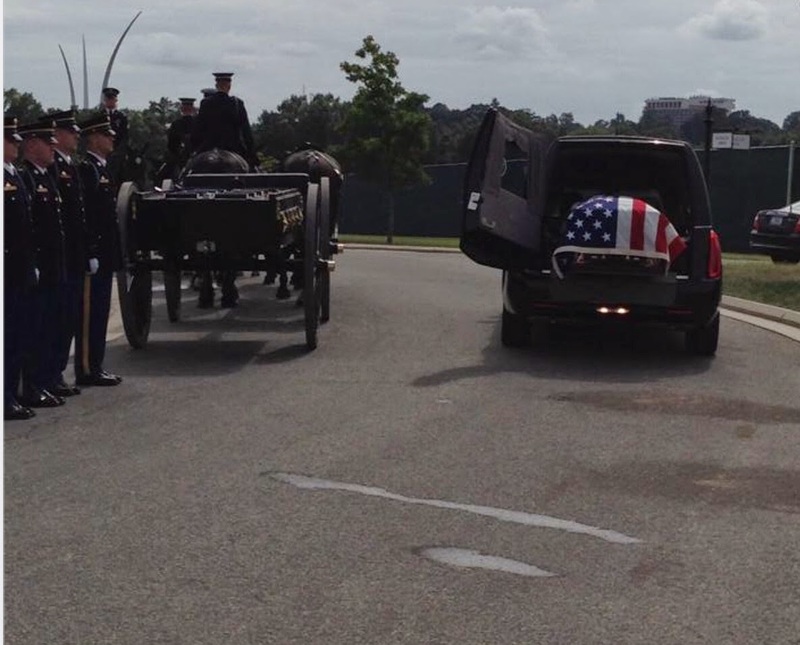 My dad’s casket was slowly and reverently transferred from the back of the hearse to the back of the horse drawn caisson as the soldiers remained at attention. 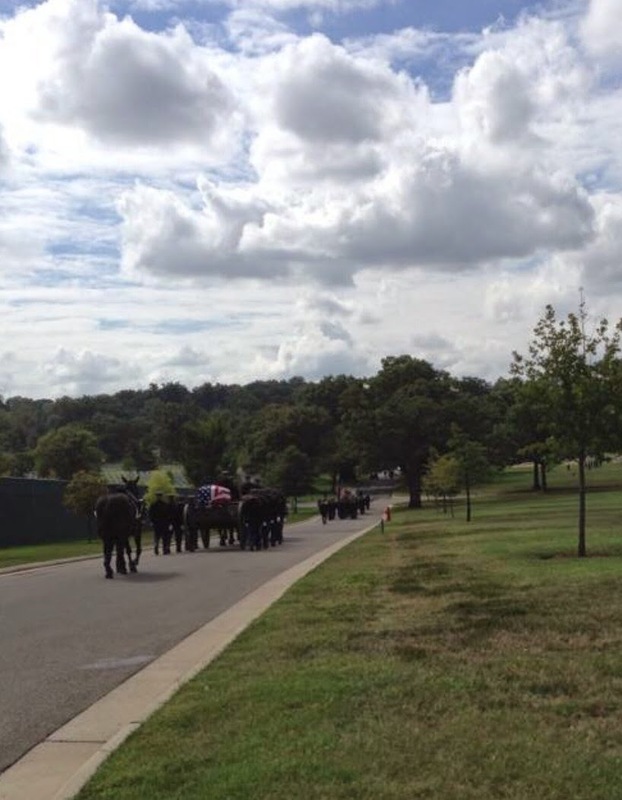 My focus was on the hearse and the casket until the riderless horse on my left began to whiny and paw at the ground. He threw his head back and stomped his hoof over and over. I saw the gleaming boots turned backward in his stirrups. My attention was locked on him and every detail of him, and then something caught my eye a little farther to my left, and I saw Zach. There he was, standing tall and proud saluting the flag his grandfather served for thirty years. My grip on Stan’s hand tightened as I leaned into his arm for support. It was almost too much to bear. It was a sight like none I’ve ever seen before. And then my dad showed up. The grandfather whose grandson stood at attention saluting the flag showed up. The father who demanded perfection and respect from my brother and me showed up. The father who could crack jokes and make bad puns decided his presence was required at the ceremony. The grandfather who loved to tell and create stories came to put his mark on the solemnity of the day. The husband who drove his wife so crazy sometimes she called her husband, “CRAP FRANK” out of pure exasperation showed up. And he showed up big time. I can’t say that the rest of the ceremony was much easier. The prayers and kind words spoken about my dad caused my muscles to tense and strain as I struggled to keep my composure in tact. The band playing taps was nearly my undoing, and the firing of the 21 gun salute shook me to my core. The laying of roses on my dad’s casket was the final piece of the tremendously beautiful, yet extraordinarily difficult ceremony but there was a levity and a lightening of my spirit about the day after the horse graced us with his load on the middle of the road, because Crap Frank rides again.